Plastics are a relatively new material to be fashioned into jewelry. For millennia, humans have been fashioning stone, metal, wood, shells and other natural materials into jewelry. Man-made materials such as plastics have comparatively only recently come into use. The mid-to-late 19th century saw scientists and experimenters formulate plastic materials for various uses. A plastic formulated from cellulose, derived from plant fiber, was an early alternative to ivory. The plastic, celluloid, was a compound of cellulose with camphor and the highly flammable nitrocellulose. (The name Celluloid was patented but would come to be a generic term.) Unfortunately this version of the cellulose plastic was very flammable. Billiard balls made from the plastic would spark when they struck each other. In the early 20th century a more stable version of celluloid plastic was developed. In this version, cellulose was formulated with acetic acid instead of using the flammable nitrocellulose which meant a safer plastic. Celluloid plastic can be made in colors and patterned designs and can be molded or carved like ivory. Collectors of vintage celluloid jewelry should be aware of safety when it comes to these beautiful collectibles. Early forms of the celluloid plastic were flammable. However, in the early 20th century less combustible cellulose acetate and Bakelite were substituted. 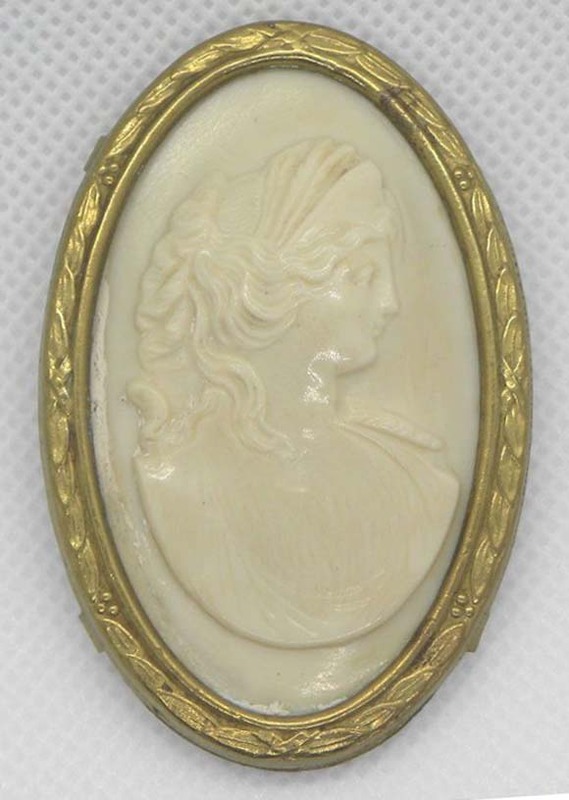 In the late 19th century, brooches were often carved out of ivory and celluloid plastic was an affordable and eco-friendly alternative to the more expensive ivory. 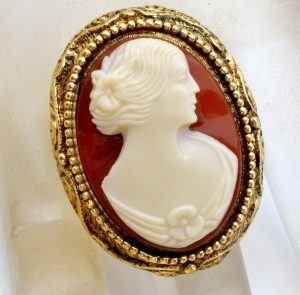 As a matter of fact the celluloid used to make jewelry was sometimes called “Ivorine” or “French Ivory” (for a type of celluloid developed in France to mimic the look of ivory). 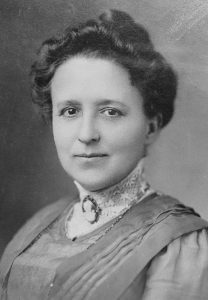 A photograph is shown of a Victorian era woman wearing a brooch. 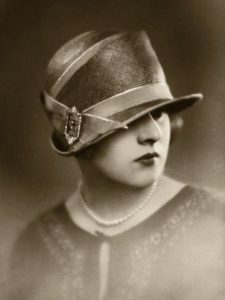 Some examples of celluloid jewelry from the early 20th century include pins worn with cloche hats, a bell-shaped hat popular in the 1920’s. 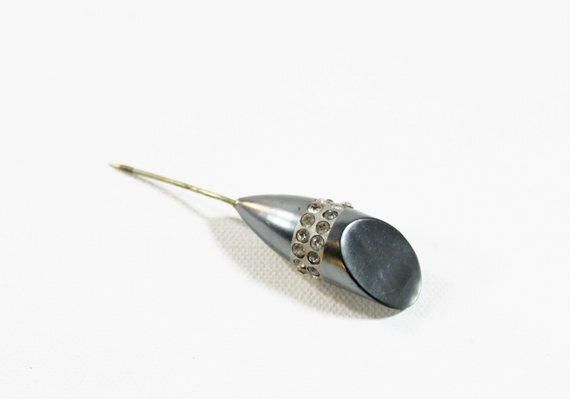 This is an example of a cloche pin – they were made in many designs and from many materials including celluloid plastic. Designers took advantage of the carve-ability of celluloid plastic as can be seen in this extravagantly carved bangle bracelet from the 1930’s. 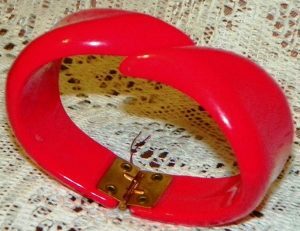 This cuff bracelet from the 1970’s exemplifies the bright colors possible with celluloid jewelry. Even if the ecology was not foremost in the minds of 19th century inventors and manufacturers of celluloid plastic, it was a sustainable, inexpensive substitute for ivory which was being harvested at very high rates. The Convention on International Trade in Endangered Species banned tortoise shell in 1973 under and cellulose acetate is often used to simulate the look of tortoiseshell. 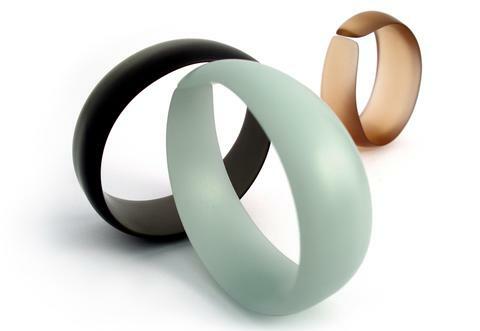 A type of celluloid jewelry is still made but from the safer cellulose acetate. 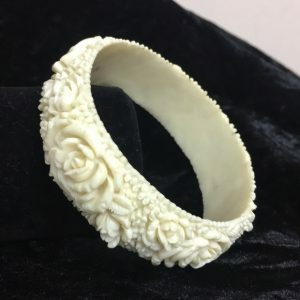 Though there are many less expensive man-made alternatives such as acrylic resin, modern celluloid jewelry is still being made. 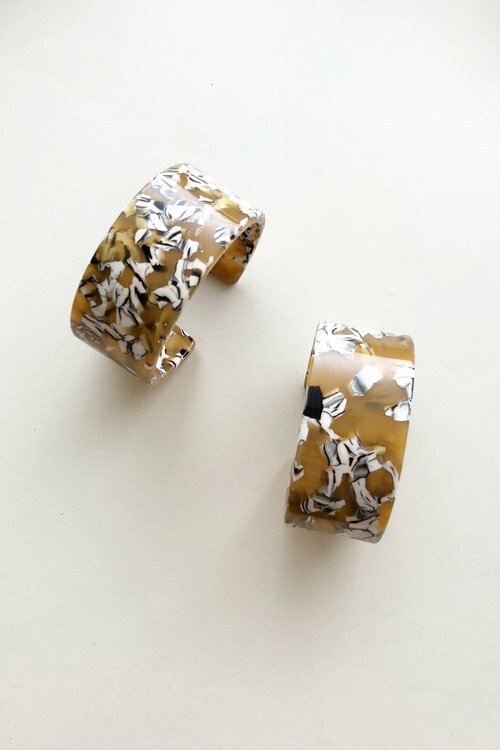 While many antique and vintage celluloid jewelry are available from retailers and from outlets such as eBay or Etsy, modern designers continue to make incredible pieces for jewelry lovers. 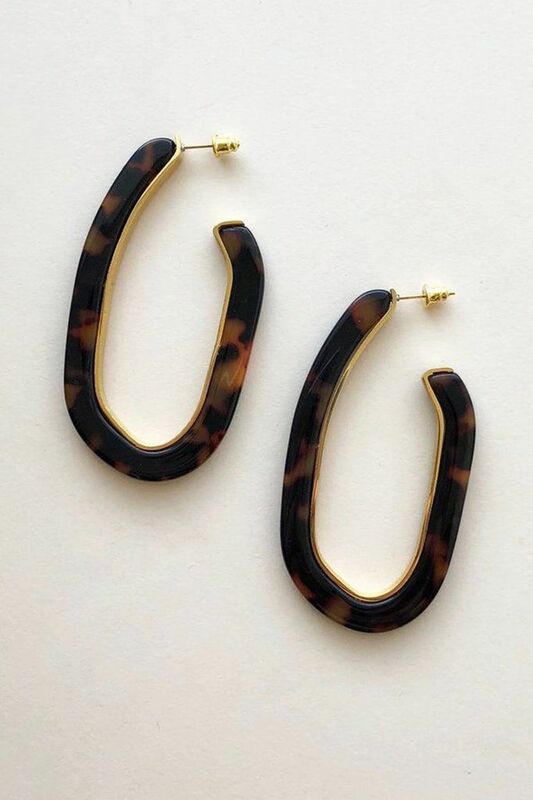 Machete is an eco-conscious, affordable jewelry line consisting of cellulose acetate jewelry designed by Jennifer Matchett. 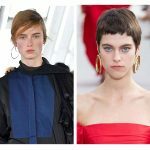 Pieces from the jewelry line have been featured on the U.S. Vogue website and other publications such as Bazaar and Instyle. 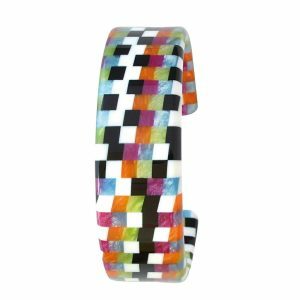 This colorful and fashionable cellulose acetate bracelet was among the “awesome gift” ideas on the website for Glamour magazine. 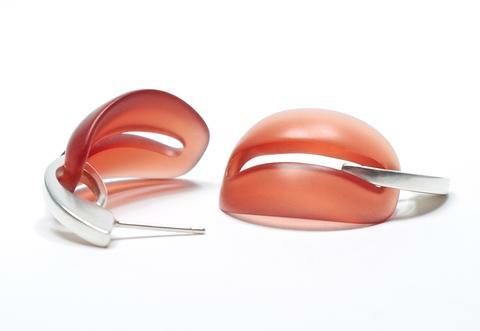 Leslie Strickland is a British contemporary jewelry designer who specializes in creating highly artistic pieces of jewelry from cellulose acetate and silver. In addition to jewelry, cellulose acetate is used to make other items like ping pong balls and guitar picks. Eyeglass frames and buttons are commonly made with cellulose acetate. In addition, cellulose acetate fibers are used alone or in combination with other natural or man made fibers to make fabric for clothing and textiles.